WP suspension (rear): The completely adjustable rear shock absorber by WP Performance Systems features rebound damping adjustment as well as a high and low compression damping adjustment. The 250 mm rear wheel travel guarantees perfect control in every circumstance, be it on tight and twisty mountain roads or in crowded city centres. Engine: The single overhead camshaft, liquid cooled, single cylinder engine features the latest in design and electronic technology. An outstanding maximum power output of 55 kW (74 hp) at 8,000 rpm and torque of 71 Nm at 6,750 rpm leave the rider in no doubt of the performance packed inside this lightweight unit. Cylinder head: The compact design of the single overhead camshaft, 4-valve cylinder head features 42 mm intake valves and 34 mm exhaust valves actuated by a robust rocker arm system which delivers precise valve timing at high engine speeds. As a result, the peak RPM is increased to 9000 rpm. Ignition is via a double spark plug layout, each of which has an individual ignition timing control for optimal fuel combustion in the large bore combustion chamber. Refined engine behaviour and optimum power delivery are the results. Wheels: Black anodised Giant tubeless spoked wheels are lightweight and strong. The 17" wheels are shod with Continental ContiAttack Supermoto 120/70 and 160/60 tyres front and rear respectively for extraordinarily light handling and exceptional control at all lean angles. Brakes: Amazing stopping power and control are available at the rider's demand thanks to the radially mounted 4 piston Brembo calliper and floating disc at the front, and the single piston calliper, floating disc at the rear (320 and 240 mm diameters respectively). The latest ABS technology from Bosch guarantees maximum safety and total confidence. Slipper clutch: The APTC (Adler Power Torque Clutch) from Adler allows for greater speeds going into and coming out of corners by maximising rear wheel grip under hard acceleration as well as preventing rear wheel instability and hopping when braking hard into the apex of a turn. The rider thus enjoys maximum control and perfect down-shifting. CNC-machined triple clamps: The anodised CNC-machined triple clamps are designed for high performance Supermoto needs. Stylishly crafted and engineered with a precise flex, they transmit precise information on the behaviour of the front end to the rider. 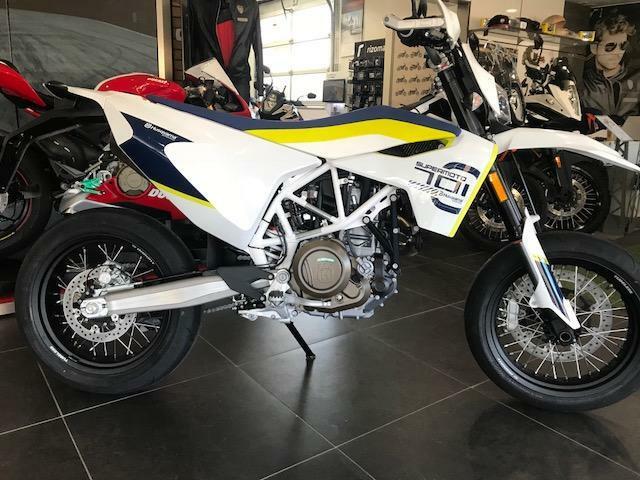 A2 licence compatible: With the specific A2 engine map that limits the power to 30 kW, the 701 SUPERMOTO is suitable for A2 licence holders who crave amazing agility and handling combined with the latest electronic safety innovations.